We are a successful Sixth Form that has high expectations of all our students. We offer a wide range of courses both academic and vocational at Advanced level, Intermediate and Foundation level. We actively encourage our students to participate in extra-curricular activities such as mentoring young students. Everyone comes to Kingsthorpe College Sixth Form with individual ambitions. Our role is to help to support you in those ambitions and to help each of you to achieve your chosen goals. We will support and mentor you throughout your time here at Kingsthorpe College and advise and guide you on a range of both academic and wider issues, including university applications and employment options. We aim to provide an excellent learning environment for post 16 studies and are confident that we can help you to achieve to the best of your abilities. 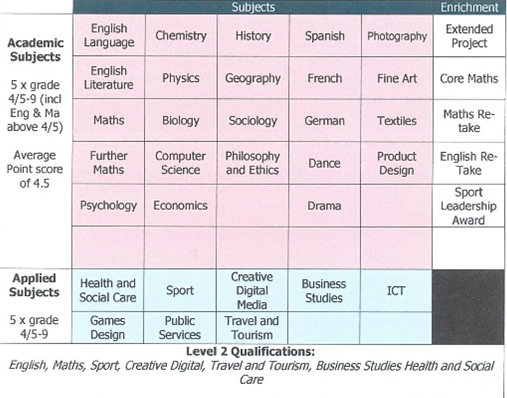 Students select three A levels or BTEC (or a combination of both), to be studied for two years. Students have 6 x one hour lessons per week for each subject. In exceptional cases, students may choose 4 A levels. Students use their spare hours to complete a range of enrichment activities, private study and sports. All students are required to participate in work experience or work shadowing both in and outside of the school day, and support can be offered for students to support them in finding placements. All students complete a minimum guided learning hours of 1080 hours per year, with many completing significantly more through a mixture of supervised independent study, work experience, and extra curricular activities.